Moody, childish, stubborn, flirty, sarcastic, sassy and pervy. (can be nice sometimes). Likes: coffee, sleeping, food, messing with people, music, videogames, and anime. Dislikes: mornings(she's a night person), the heat, bright lights(her eyes are sensitive to bright lights), being bossed around, Embarrassment, restrictions, and crying in front of others. She has a younger sister named Maki. (I'll do a bio on her soon). 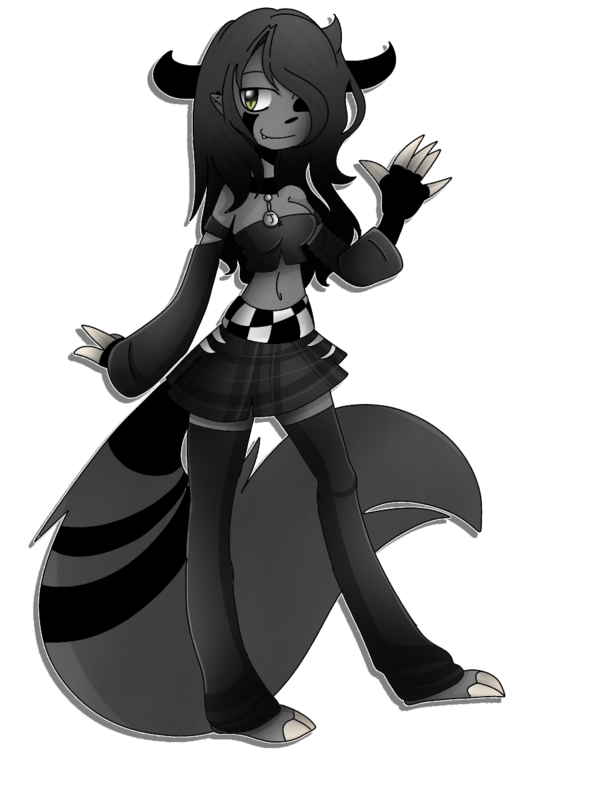 Demon: dark gray skin, long black horns on the side of her head, pale tan claws(kind of like sloth claws), deer like hooves on feet, black stripes on her gray tail, and a black marking under her right eye. Short top with lowered long sleeves(sorry I'm not that great at describing), checkered belt, with black flannel skirt, with white clips, with long black leg warmers. Two hoop piercing on her left lower and middle ear, and one stud eating on her right ear, and a black choker necklace with a silver pendent. That has her first initial on it. (She has her first initial 'J' on it, the same with her sister. She has an 'M').